Astragalus and Oxytropis represent one of the largest angiosperm genus complexes. It is widely discussed why - and if at all - it contains so many species. Here, we discuss how the genetic divergence in a postglacial relict species, Oxytropis pilosa, can provide insights into the relative genetic variance of taxa. Methods are introduced to obtain sequence clusters of similar genetic diversity and to detect statistically significant differences. 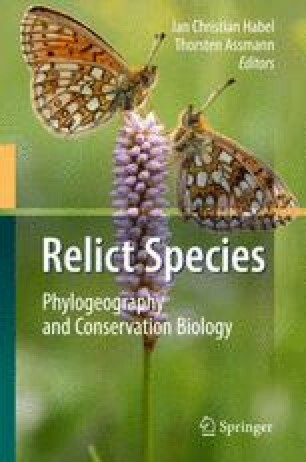 These approaches provide objective means to identify taxa that deserve the same protection efforts, independent of a fixed species concept. O. pilosa ITS sequences display an inter- and intra individual variance, comparable to clusters comprising numerous accepted species. Regarding genetic diversity, some O. pilosa populations represent relicts that deserve the same or a higher protection status than some species of Astragalus. We discuss the need of objectivity in identifying the evolutionary hot spots as well as the measures to define and protect them. Special thanks go to Angela Dressel and Karin Stögerer for technical assistance, and to Wilhelm Sauer for discussion. Reiner Schmahl, Eberhard Koch, Natalie Schmalz and Matthias Kropf, Ludmilla Barjaewa, Ludmilla Mantschenkowa, and Erich Kalmbach, Friedrich Schlee, Evgenia Zeidler-Schewzowa, and the University of Barnaul (Altai, Siberia) are kindly acknowledged for contributing plant material, GZU, LY, M, and MA for sending specimens for revision. Hospitality of the visited herbaria BC, BOLO, C, DR, E, FB, FI, FR, G, HBG, K, LE, LI, LJU, M, MPU (incl. SIGMA), P, RO, S, STU, TUB, UPS, W, WU, and Z was enjoyed with great pleasure. The project was supported by a grant of the “Landesgraduiertenförderung Baden-Württemberg”; grants for travelling were obtained from “Reinhold-und-Maria-Teufel-Stiftung” and the German Academic Exchange Service (DAAD).